"A local radio station and newspaper received six different photos from an anonymous source that show a capsule-shape UFO hovering over a farm pasture. In a letter accompanying the photos, the source claims to have taken the remarkable UFO photographs on the 16th of September, 1996, in Valley, Alabama, USA." A local radio station and newspaper received six different photos from an anonymous source that show a capsule-shape UFO hovering over a farm pasture. In a letter accompanying the photos, the source claims to have taken the remarkable UFO photographs on the 16th of September, 1996, in Valley, Alabama, USA. According to the photo taker, he was repairing a fence on his property when his dog started barking loudly. Going over to where his dog was, he looked up to see a low-flying capsule-shape UFO hovering and moving slowly over one of his cow pastures. The UFO captured in each of the photos resembles the Mercury, Gemini and Apollo space capsules that the United States launched in the early years of its space program. Black to dark green, the cone-shaped capsule, when blown-up, shows a black teflon-like covered bottom and a flange or rim that goes around near the top of the unknown object. 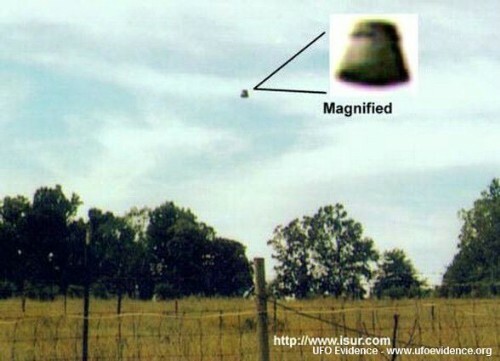 In each photo, the UFO is shown at a slightly different position and elevation, making it more difficult to hoax, according to researchers who have examined the photographs. The photos and a copy of the letter were aired publicly for the first time on TV-33 in Lagrange, Georgia on 26 September, 1996. On the "Heston & Steve" show, the two hosts, Heston Yates and Steve Smoots, along with John C. Thompson and Jimmy Smith, field investigators for the International Society for UFO Research (ISUR), speculated about whether the UFO photos are real. All of them agreed that if the photos were part of a hoax, it was a most strange and clever one. Mr. Thompson said on the program that he was "most favorably impressed by the photos." He also has stated since then that he has two witnesses who saw similar shaped UFOs in May and July in the LaGrange area, which is only 20 miles from Valley. Another witness that he has located, says he and others saw the exact craft, incredibly, 25 years earlier in Atlanta. Mr. Smith, a long-time investigator and actual sightee of UFOs, said the photos appeared genuine. He also said that he himself, in 1971, had seen a UFO with a likeness of what the photos depict. He then went on to relate that the 1971 UFO had cut off power to his pickup while he observed it. The photos, along with a copy of the letter from the alleged photo taker, have now been sent to Jeff Sainio, a photography expert who specializes in analyzing UFO video and photos. Mr. Sainio, who often does photo analysis for the popular TV Sightings program, will determine if the photos really show a UFO. In the meantime, it is hoped that the person who took these amazing photos will step forward and allow access to the negatives that the photos were made from. All persons involved in investigating the photos are assuring the photo taker over TV and radio that if he wishes, his anonymity will be kept.